Summary: Living in the mid 1400s, Nanolatch and Nana are the long heralded “Salmon Twins” born to the Kwakiutl tribe. As they approach the time of their initiations when they will take their places as adults, the tribe is thrown into upheaval when a rival tribe offends the Salmon men through over fishing. A war is begun, and the spoils of the attack include Noh, an apprentice shaman from the other community. Her presence affects the lives of both of the twins, and as she comes to love them both in different ways, Noh finds herself knowing the future but being unable to stop it. The trials of growing up drive a wedge between the twins as their genders lead them down different paths, but as the chief’s children their fates are closely tied to the fate of the tribe. When the salmon stops running, it is up to Nanolatch and Nana to bring them back. 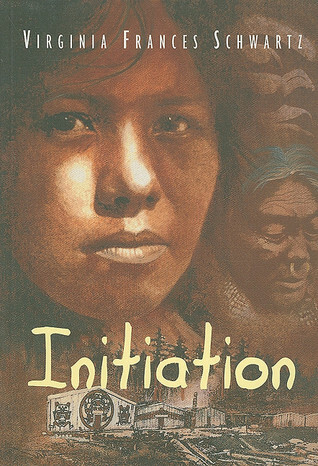 Review: It took me some time to get into Initiation by Virginia Frances Schwartz, but once I did, it was an arresting read. Schwartz weaves her story through three characters: twins Nanolatch and Nana and Noh, a captive from another tribe. Noh is a shaman in training and had dreams that she would one day become connected with the twins, but the circumstances under which that connection comes about are painful, because they involve an ill-conceived war and many deaths. Schwartz’s story-telling style is unique, because although Noh wasn’t exactly a main character, her point-of-view adds quite a bit to the tale through her visions and the willingness of others to tell her things. Of the three stories that unfolded, I was intrigued most by Nana’s struggle against her environment. Born as a twin, her sense of equality is stripped by the fact that she was born a girl and her twin, Nanolatch, is a boy. Both genders have prescribed roles within the tribe, with little leeway for crossover. Though Nana knows she is meant for something more, perhaps fishing or being a warrior, she is restrained by her female body, and her father’s insistence that she learn how to weave. Her one saving grace is her position as a Salmon twin because her tribe believes she and her brother will be able to call the salmon in the spring. This gives Nana a chance every year to be by the water, and every year she begs her father to leave her there. The matter isn’t helped by Nana’s belief that she has no place in her father’s heart, an untruth only revealed too late to save her. I set the age range at 13 to 18 because I believe different levels of readers will be interested in different parts of the story. There’s enough depth and layers in it for older teen readers, but I think younger teen readers would enjoy it as a surface-type read about Native life and myths. Schwartz herself states in her Author’s Note that the book was inspired by a Kwakiutl transformation myth and she takes this simple myth to another level through her poetic imagining of the Salmon twins. “Cries heave from my gut. I no longer know who I am with this pain, never felt before, burning through me. Never imagined that one, whose eyes I have looked into since I was born, is not here anymore. Those deep brown eyes knew me best. He saw each layer of my soul, naming places I had no words for. Initiation by Virginia Frances Schwartz is published by Fitzhenry & Whiteside, (2003).